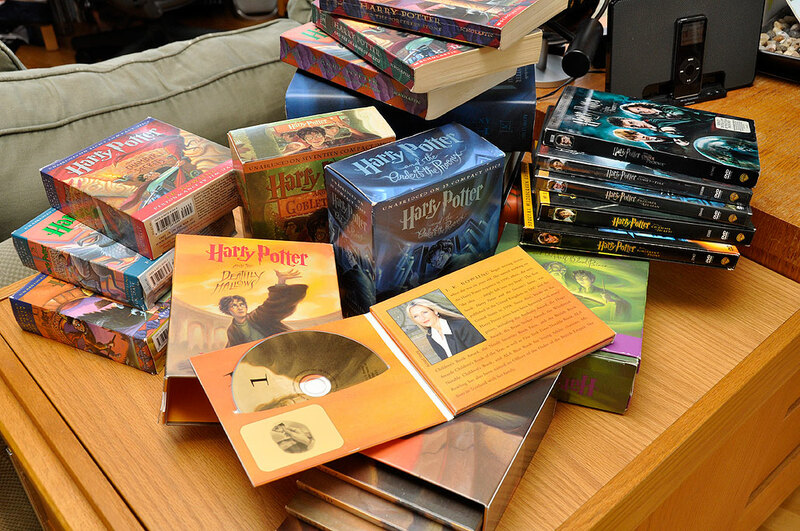 The Harry Potter books have been and still are hugely popular all around the world. The stories are imaginative, adventureous, and deeply engaging. The movie premiere of Part 1 of the last of the Harry Potter series may be the one thing which can compete with the opening of the MFA Art of the Americas Wing here in Boston this weekend. Folks here are huge Harry Potter fans. The RainyDayLibrary has a complete collection of Harry Potter books, CDs, and DVDs. We have been to many of the midnight book releases, gatherings, and events. The office has been known to head out to lunch and come back four hours later because everyone decided that it made more sense to go to the afternoon show of a Harry Potter movie on opening day than to fight the lines after work. We have listened to the entire series (116 hrs) about half a dozen times since we first got them three years ago. They make our frequent four-hour drive between Boston and New York City seem like a short hop to the grocery store. Jim Dale is the voice of all of the characters in the entire Harry Potter audiobook series in the US (Stephen Fry is the voice for the series in the UK). The performances are just incredible. Go here to listen to samples of Jim reading from the Harry Potter books. Swapping CDs in and out of the player is no big deal when you are at home but kind of a pain when driving, so we bit the bullet and entered the entire 99 disc collection into iTunes. This effort took the better part of a weekend and consumed about 80GB of drive space, but it was well worth the effort. Now we can load just the book we want and listen to the entire performance without interruption. Depending on the storage capacity of your iPod, you may even be able to load more than one book at a time! J.K. Rowling and her stories have generated an immense amount of wealth for a lot of people (writer, publisher, actors, movie studios, etc…). That gravy train will be running strong for quite sometime to come. This weekend is the movie premiere of Part 1 of Harry Potter and the Deathly Hallows. Part 2 is scheduled to be released in the Summer of 2011. One thing is certain, we will be there on opening day. A must-see for HP fans!